Master of the noir suspense story, Cornell Woolrich was born 110 years ago today. Having created one of the greatest collections of suspense novels and short stories ever written, he died in 1968, depressed and wheelchair bound. My Nov. 20 blog article summarized his work: He wrote more than 25 novels, numerous screen plays, dozens of short story collections and his stories and novels were the source for more than 125 movies and TV dramas. His most well-known work, the short story, Rear Window, was the basis for a 1954 Alfred Hitchcock film of the same name. Another short story, The Boy Cried Murder, was the basis for three movies: 1949, 1966 and 1984. Sadly, many of his works are out of print and nearly forgotten. The latest movie taken from a Woolrich novel was the 2001 production “Original Sin,” based on the novel, “Waltz Into Darkness.” Many of his movies are unavailable on DVD although some occasionally show up at film festivals. The toast.net site has a beautiful collection of vintage Woolrich book covers, posters for a sampling of his movies, a brief biography and links to buy a selection of his books on Amazon. Some of the books are pricy, some not. Most are used. When looking for Woolrich novels and short story collections, take note that he also wrote under two pen names: George Hopley (his middle names) and William Irish. Cornell Woolrich was not a prose stylist with the sledgehammer metaphors of Raymond Chandler. The secret to Woolrich’s stories is the tension, the unanswered questions, the average guy who finds his world turned upside down and begins a headlong search for reality. His “Black” novel series from the 1940s includes “The Black Alibi,” “The Bride Wore Black,” “The Black Path of Fear,” “The Black Angel” and “The Black Curtain.” In the latter title, Frank Townsend suffers a nasty blow to the head when a portion of a building’s brick roof coping falls on him. He dusts himself off and walks home only to find that his apartment is vacant and that his wife moved months before. He manages to track down his wife who is overjoyed–and a little shocked–to see him because he’s been missing for three years. The balance of the book puts a unique twist on an amnesia tale. It’s a story of love and murder moving at a breakneck pace. Woolrich’s stories, set in dark urban surroundings of the 1930s and 40s, hook you at the beginning and pull you into worlds that he imagined and you can live in for as long as the story lasts. 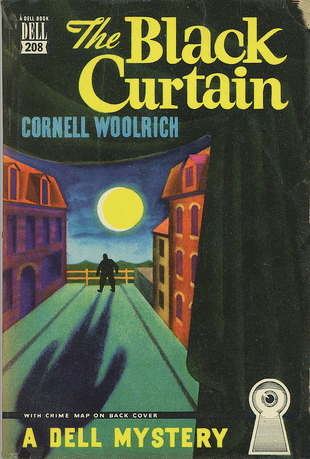 Essentially a fan page, titled CornellWoolrich.com, this site has book covers, movie posters, Woolrich archive materials and more. Many of Woolrich’s stories became radio dramas. This site has collection of the programs in audio format. Cary Grant and Joseph Cotton are among the famous names giving voice to the suspense shows. Listing of episodes of TV dramas such as “Alfred Hitchcock Presents” featuring Woolrich stories. The shows are available for download/viewing. The Woolrich page on Facebook has some colorful pictures of his book covers and 945 “likes,” but nothing’s been posted for nearly three years. One of your best Posts yet Mr. Bacon – lots of great insight, info, & links! Good job!